Each year, there are more and more ways to listen to information and entertainment in America. Radio, on-demand streaming, podcasts, digital radio services, satellite radio... the list continues to grow. Furthermore, there is little doubt that we are in a golden age of media overall, as content is available everywhere and across all devices. Yet, according to Nielsen’s second quarter 2017 Comparable Metrics Report, radio remains the top way to reach consumers across all media platforms. Each week, more Americans tune into AM/FM radio (93%) than watch television, or use smartphones, tablets or computers. At the same time, streaming audio offers consumers even more ways to listen across many of those same devices. So, to really compare apples to apples, we need to consider AM/FM radio (both over-the-air stations and their online streams) alongside all forms of streaming audio (apps and websites that stream both music and talk) and turn to comparable metrics. This allows us to go in-depth with audio use and evaluate listeners, using three basic concepts that can be applied across all media: how many, how often and how long. 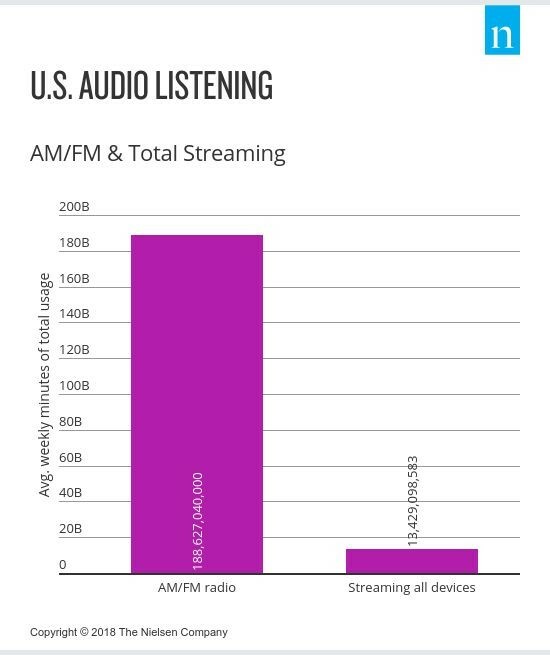 When viewed through these comparable measures, we can see how AM/FM radio and streaming audio stack up. How many: When it comes to how many, AM/FM radio continues to reach significantly more people each week than any other medium in the U.S. at 228.5 million adults 18+ compared with 216.5 million for TV (live, DVR and time-shifted), 204 million for app/web on a smartphone, and 127.6 million for video on a smartphone. Looking at the audio landscape, broadcast radio’s weekly reach of 228.5 million also outpaces the 67.6 million using streaming audio, 35.9 million using satellite radio and 20.7 million consuming podcasts. How often: Americans use radio five days per week, compared to three days for streaming on smartphones and tablets and two days for streaming on a computer. How long: By understanding the reach (how many) and frequency of use (how often) for each form of audio, we can calculate the time spent (how long) for both radio and streaming audio. When comparing gross minutes (the total time spent summed for all p18+ users) radio outpaces streaming audio by a factor of 14:1 in an average week. Adding up the total minutes for AM/FM radio and streaming audio equates to more than 202 billion minutes per week, with AM/FM representing 93 percent of total weekly minutes compared with roughly seven percent for streaming audio. As technology drives all media usage forward the audio landscape continues to expand with even more options for consumers. Through all of the changes, AM/FM radio continues to reach more people and garners the most time spent with audio. To hear more about the audio landscape, Nielsen has launched a new podcast and in the inaugural episode offers listeners a Guided Tour of Radio -- from Nielsen’s Perspective. Sourcing: Nielsen’s Q2 2017 Comparable Metrics Report uses audience measurement data from an average week during the second quarter of 2017. AM/FM radio data is sourced from Nielsen’s RADAR and National Regional Database systems. Streaming audio data is sourced from Nielsen’s Electronic Mobile Measurement (EMM) panel and is inclusive of sites and internet applications used on smartphones, computers and tablets which are specifically designed to provide audio content for both music and talk (e.g., Pandora, Spotify, iHeartRadio). Data for the audio landscape description in the “How many” paragraph uses Nielsen Scarborough USA+ Release 1 2017 which tracks weekly online radio/music sites (e.g. Pandora, Spotify, iHeartRadio, TuneIn) used to represent streaming audio, as well as satellite radio and podcast consumption.